Designing and making is something that Ailsa Rendell has been interested in from an early age. Ailsa trained at the Royal Scottish Academy Of Music And Drama in Glasgow where she specialised in Costume Design and Costume Making. She then worked in the world of theatre and film for a number of years before turning her hand to Bespoke Occasional wear. Ailsa’s career has taken her to many corners of the world, including London, New York, South Korea and Taiwan. In March 2005 she represented Scotland at the World Stage Design Competition in Toronto, Canada with Ailsa’s costume designs for the play “Spring Awakening”. Most recently Ailsa had the privilege of designing and making gowns for The Scottish Sun’s Miss Scotland Final in 2011 and 2012. The gowns were worn on the night of the final at Glasgow’s Royal Concert Hall and featured in the Scottish Sun Newspaper. 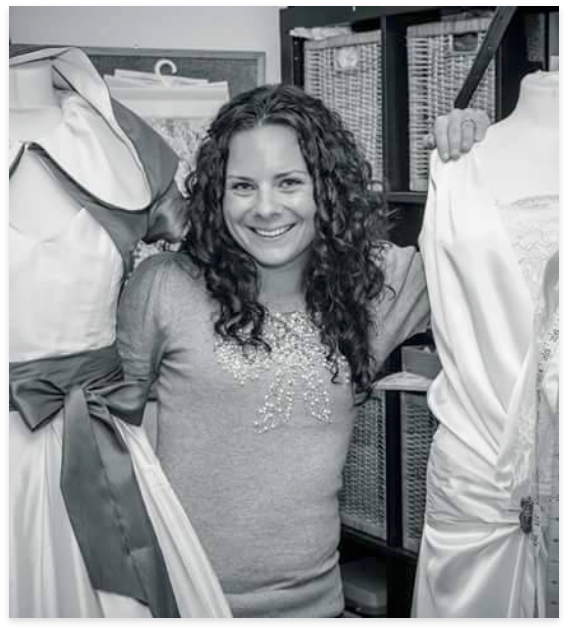 In 2016 Ailsa had the great honour of becoming a finalist in the Bridal Designer category at the Scottish VOWS Awards. No matter what the project or design, Ailsa is dedicated to providing a first class product. She listens to her clients wishes and provides a unique and professional service that helps complete any special day. This can be done in person or over the phone. Ailsa spends this time getting to know your style and tastes. From this meeting Ailsa will get an idea of your requirements and thoughts on your outfit and can help advise on what will work for you. It does not matter if you have no ideas about what you want, or for that matter if you know exactly what you want it to look like, Ailsa will take all of the information from this consultation and provide you with a variety of designs and sketches, providing different options for you. Once a final design has been settled upon, we must decide upon colour and material. Ailsa will provide you with samples to choose from, the cost of the fabric will be the big factor in setting the cost of the quote. Once a fabric is chosen, Ailsa will offer you a quote and you can decide from there whether you want to go ahead, if its not for you or if we need to tailor the quote to suit your budget. There is no obligation at this stage, should you decide that a custom made outfit is not for you, you can walk away with no charge. That is the whole point of this consultation stage, to explain to you how the process works and to see if it suits you. If you are happy, Ailsa will set about making a pattern and toile, using the toile in the first of three fittings, Ailsa will make the item to fit your body shape. At this stage, you can still change the design – alot of the time you cant tell how a design will look until you see it on. This is the luxury of custom made outfits, you can develop the design during the process. The final stage is making the item in the chosen material, having another fitting along the way and then one more when finished to view the finished article. "Hi Alisa. This is a simple thank you with all our hearts for Olivia's beautiful dress. All I can say is she wore it well. It was simply stunning. Of course hers was the stand out - for the right reasons. I'm still waiting on the official photographs- to which I'll send you anyway. But here's a few. Thank you .... just thank you. You're awesome and the best at what you do." AJR Designs shared a post. The Scottish VOWS is the longest standing Scottish Wedding Awards. If you are a supplier who is new to the VOWS Awards visit www.dctevents.com/how-vows-works/ for information on how to register.